I’m not sure if this cartoon by Bill Watterson quite captures the general point of this post, but let’s see. Basically, I want to argue that we now know enough to be able to say that global warming caused this summer’s heatwave, and that there are compelling reasons why we should. I’m prompted to write in response to an article by Damian Carrington in the Guardian last Friday – perhaps you read it? The title was: ‘Extreme global weather is ‘the face of climate change’ says leading scientist‘. But also by a short twitter exchange I had with Paul Roundy. 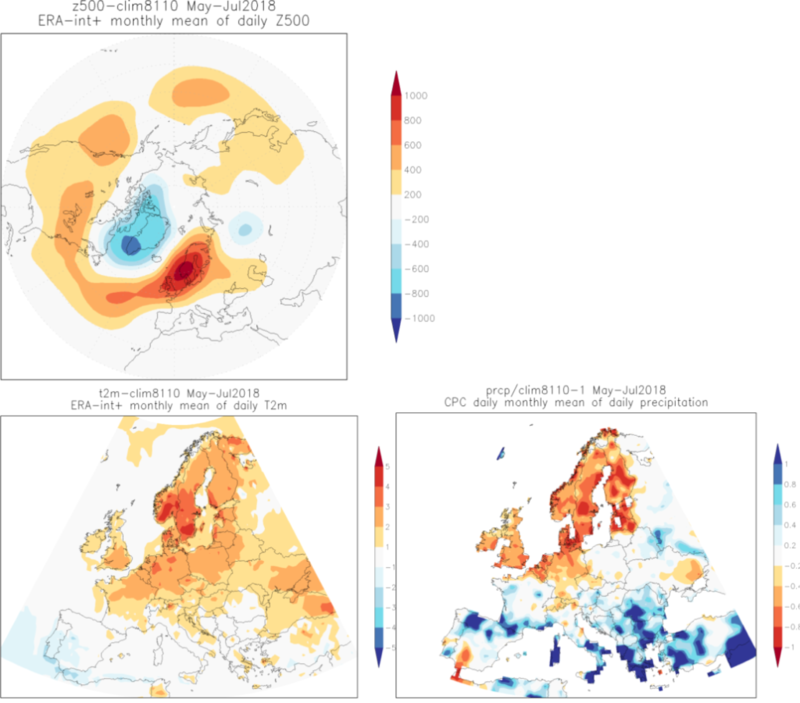 In his article, Carrington refers to a ‘rapid scientific assessment’ of the heatwave conducted by scientists from the Royal Netherlands Meteorological Institute (RNMI) and the World Weather Attribution (WWA) consortium. As the name suggests, the consortium is interested in attribution – i.e. can we attribute an external driver x to an event y? For the purposes of their study the researchers defined the external driver as “human-caused climate change” and the event – the heatwave – as “the three-day maximum temperature average…at individual locations”. I was attracted to the article, and then to the WWA analysis, because I was looking for further confirmation of something I assumed was pretty obvious: that it’s so flaming hot across the planet because our carbon emissions are warming the planet which, in turn, is changing its climate with unprecedented speed. In other words, further evidence that we are responsible for – are causing – the horrors we’ve been experiencing globally this summer. But I didn’t get that. Instead, what I got was a painful display of linguistic gymnastics: scientists desperately implying causation but not coming out and saying so explicitly. Here’s how the consortium begins to answer my question: did we cause the heatwave? First it starts by carefully defining its terms. In the quote below you can see that the scientists are being very careful to focus on the role of climate change – what role does it play – and whether and to what extent human-caused climate change can explain the temperature changes. You’ll note that nowhere is the word ’cause’ used to describe the relationship between event (heatwave) and driver (human-induced climate change). “[T]o assess the role of climate change, we compare observations with results from climate models that are available and suitable for the temperatures in these locations. This answers the question whether and to what extent external drivers, in particular human-caused climate change, can explain the temperature trends in the observational data. Including models allows us to give the causation of a trend”. The findings of their study aren’t presented as cause and effect either. Attribution becomes an estimation “that the probability to have such a heat or higher is generally more than two times higher today than if human activities had not altered the climate”. I can’t say that I find this result particularly helpful. It left me scratching my head, to be honest. Probability (ermm, what does that mean again? ); generally (so not always? ); more than two times (3, 4, 20, 100 times, how many!? ); than if we hadn’t altered (how is that possible?) the climate. Imagine trying to use this study as evidence to a bunch of your friends down the pub – it’s so precise as to be almost useless! You can imagine it, can’t you. The day after. ‘You know, I was down the pub last night and this guy was saying that we didn’t cause climate change but there’s a 50% probability that it was, no, a 5% probability, or was it twice as likely, that climate change is happening…Oh, I don’t know’. Result: an advocacy disaster! I suspect at least some of the authors of the study are aware of this. Geert Jan van Oldenborgh of the RNMI, for example. Quoted by Carrington, Oldenborgh is just aching to use the C word, but doesn’t. Instead, he resorts to metaphor: “We can see the fingerprints of climate change on local extremes”. Great, that’s really helpful – now all I can think about is jewel thieves and CSI: Crime Scene Investigation! Come on Geert, we all know that if your fingerprints are on the murder weapon, you’re pretty much busted! So why not say so? Human-induced climate change caused these extremes. Say that to your friends down the pub – they’ll understand that. “The current heatwave has been caused by an extraordinary stalling of the jet stream wind, which usually funnels cool Atlantic weather over the continent. This has left hot, dry air in place for two months – far longer than usual. The stalling of the northern hemisphere jet stream is being increasingly firmly linked to global warming, in particular to the rapid heating of the Arctic and resulting loss of sea ice”. “The impacts of climate change are no longer subtle…We are seeing them play out in real time and what is happening this summer is a perfect example of that… We are seeing our predictions come true”. No kidding Mann – subtle is definitely not how I’d describe this summer’s weather events, as the figure below (taken from the WWA report) illustrates. I hesitate to make too much of just one quote without seeing the entire interview transcript, but on face value this doesn’t make a whole lot of sense. We’ve already established that climate change means human-induced climate change, and Mann himself is saying “with great confidence” that (human-induced)climate change is making events such as this summer’s heatwave more extreme. So why doesn’t he just say caused; why replace that with one of the vaguest (and ugliest) words in the English dictionary – “impacting” (ugh!)? Why can’t he say: I am (greatly?) confident that human-induced climate change is making heatwaves more extreme? That’s a clear message. When Carrington asked the right question to Prof Mann: ‘Prof Mann, is climate changing causing this summer’s heatwave?’ The right answer, and the answer Prof Mann should have given, is: Yes. Ok, I guess I’d better return to that Calvin and Hobbes cartoon. I think the problem illustrated here is that these climate scientists spend a lot of time looking at relationships between x and y. I mean, that’s what they do, very carefully, very precisely. Climate change science is essentially marriage counselling with a microscope. They see the complexity and all the shades of grey that Calvin describes to Hobbes; nothing, they tell us, is as clear and simple as it first appears. The problem, however, is that knowledge can paralyse you – prevent you from doing or saying something. I think that’s what’s happened here: Mann knows so much that he can’t bring himself to say something simple – like x causes y – even though that’s what’s going on. The final message of the cartoon is wrong, of course. 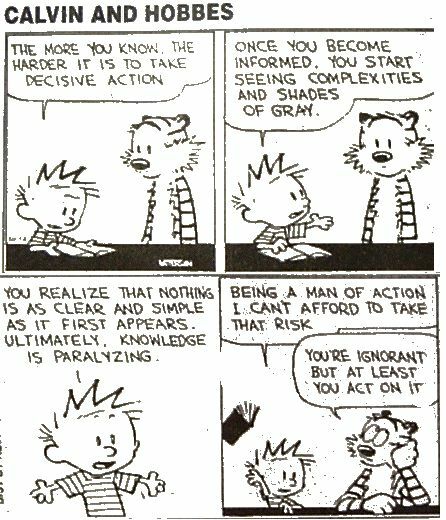 Calvin says: “Being a man of action, I can’t afford to take that risk”. Hobbes replies, rolling his eyes: “You’re ignorant, but at least you act on it”. In the case of climate activism, thanks to scientists such as those at WWA and, of course, Prof Mann, we are no longer ignorant of the effects of our actions on our planet’s climate. And Calvin is right, we can’t afford to ignore those effects any longer. But tiptoeing around language, when it’s pretty clear who’s causing what? That’s a recipe for paralysis, not action. Previous Post How will you be celebrating Earth Overshoot Day?